Charge and Organize Products to Managing Multiple Handhelds Apple iPods and iPads -TriBeam Inc.
Click to view Apple iPod and iPad Sync Charge Docking Stations! Handheld devices are relatively inexpensive, but powerful computing tools with a multitude of applications for educators to choose from. 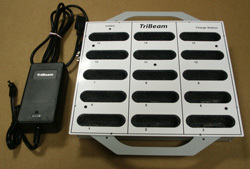 Our charge and organize products ease the operational management of handhelds in the classroom. Contact us to meet your specific handheld charging needs. Mobile Sync charge organize station. Mobile Charge and Organize Station allows easy repositioning within the classroom and features a built-in, locking cover. Quick charge all handhelds at once. Contact us for other tablets charging needs. Android based tablets. 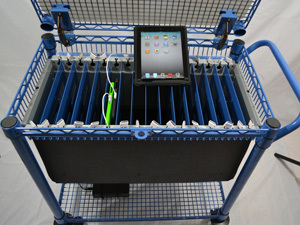 Rolling cart to easily transport Apple iPad Tablets between classrooms on school campus. Lightweight wire mesh cart makes it easy to move. 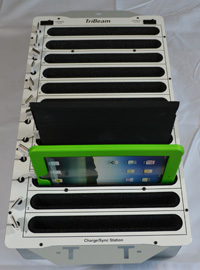 Supports up to 32 iPads for charging and storage system in a rolling cart for easy transport from classroom to classroom. Quick charge all 32 iPads at once. Can also be configured to sync or charge your iPads. Contact us for other tablets charging needs. 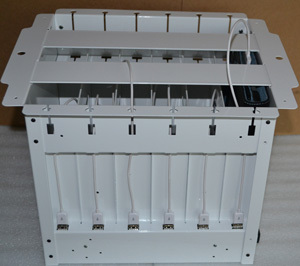 Convenient 12-slot sync charge and organize iPad docking station. 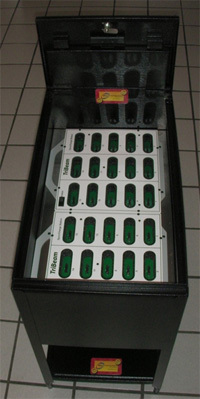 12-slot charging and storage station. Boasting a compact tabletop design, the Tabletop Charge & Organize Station can be locked in a file or storage cabinet for extra security. Charge all 12 Pads at once. Apple iPod 15-slot multi charge & organize station. Quick charge15 Apple iPod devices at once. Can upgrade for 30 iPod devices. Available in mobile cart version expandable from 15 to 60 devices. Apple iPod 15-slot multi sync/charge & organize station. Compact dock station to SYNC and CHARGE multiple Apple iPod devices. 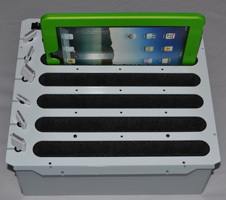 The lightweight tabletop design is a practical and economic charge and organize solution. Use iTunes to sync multiple devices with individual content. Comes with SyncEZ software to easily master image clone/copy multiple iPods. Convenient Apple iPad 6-slot Sync Charge organize docking station. Compact station to Sync and Charge multiple iPad tablets. 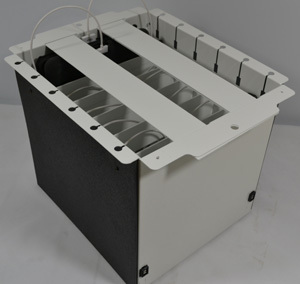 The lightweight tabletop design is a practical and economic charge and organize solution. Charge 6 iPads at once. Transport cart to easily charge/store up to 16 laptop computers and other devices. A Laptop cart you can actually move! Compatible with any laptop, it offers a 16-slot charging and storage system that includes a rolling cart for easy transport from classroom to classroom. Comes with Easy View locking cover. Desktop height top loading makes it easy to store laptops. Lightweight wire mesh cart is easy to move. Designed to be used with your existing laptop chargers. Optional configurations available to setup the cart to organize various portable devices. Available in 6 or 12 unit capacity.